Whilst the Internet has brought us many benefits, technology alone cannot replace the knowledge, expertise and personality offered by an experienced business travel agent. Technology does its best to mimic real human interaction, (most of us have used a chatbot at some point) with all the will in the world, it's just not the same as speaking to a real person. Your travel consultant knows the business travel products they are recommending to you inside and out; they'll make recommendations based on your unique preferences and their insight into your likes and dislikes. Nothing beats having a friendly and familiar person on the end of the phone whenever you need them. Instead of purchasing your fare immediately on the internet, which commits you to the restrictions that some tickets come with, a TMC can hold seats for you using their “global distribution system”. This means you can change or cancel your flights up until your fare expires, giving you the opportunity to fine tune any last-minute adjustments to your trip without incurring a cost. It's easier to reconcile expenses through one supplier, TMCs provide payment solutions such as lodge card solutions and credit accounts that help give you full control and visibility of where you are spending and improves your company's cash flow. They can also arrange hotel bill back which means the traveller doesn't have to settle the bill when they check out, instead the hotel sends the invoice to the TMC to pay, who is then paid by the corporate client. This solution also means you can add meals and other sundries to your rate, all itemised on your bill saving time in submitting additional expense claims. A TMC will notify you of any bookings requested to high-risk destinations to ensure travel is approved. They'll also assist in advising the traveller of any risk-mitigation strategies they should be aware of along with the latest passport and visa requirements, which they can process for you too. Traveller tracking and crisis management also means they’ll be there for you and your travellers in the event of a crisis. If it's 9 pm local time in your destination and you need to change your plans immediately, and you’ve booked directly online, your options to amend your plans aren't always simple. To change a flight with an airline over the phone, it could take you ages to get through especially in the event of an unforeseen incident. With a TMC's 24-hour department, you can relax knowing you have 24-hour support to change your plans or even hold alternative travel options for you. 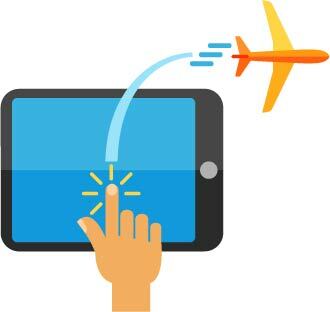 If your travellers are booking multiple flights across different internet sites, it can be hard to keep track of where you are spending money, which limits your ability to have full control of your travel spend. Detailed management information reports and real-time data dashboards give you in-depth insight into your business travel habits, so you can spot trends and opportunities to improve. Allowing companies to offset their travel budget through an accumulation of corporate points, if using a travel management company, your account manager will be able to advise you which schemes your organisation should enrol in. You’ll receive a membership number which your travel management company will add to your company profile so that it’s automatically added to all bookings. This means you’ll collect points without having to do a thing. How much each customer will benefit from each scheme depends on their level and type of spend with the relevant airlines, however, on average an airline corporate reward scheme will earn a client between 1% and 5% back from their travel spend. The important thing to remember is that these schemes don’t cost anything to join and your travel management company will administer them on your behalf, so they require no investment at all, you really have nothing to lose by becoming a member.